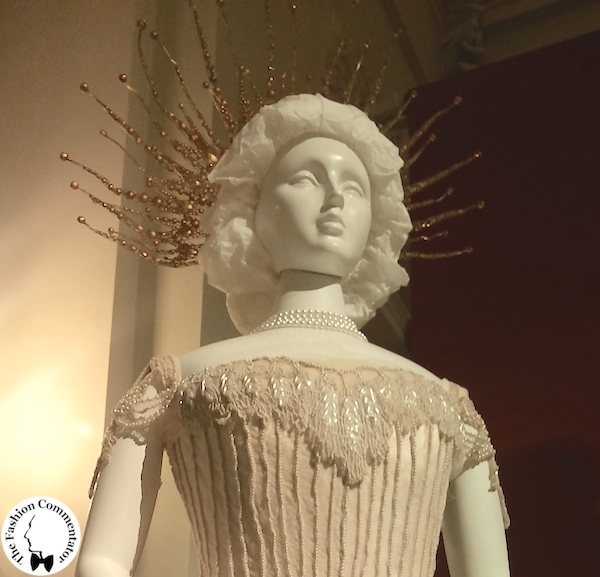 Among the events that took place in the city of Florence during Pitti Uomo, the Costume Gallery of Pitti Palace hosted the presentation of the exhibition “The court cape of Lady Franca Florio”. 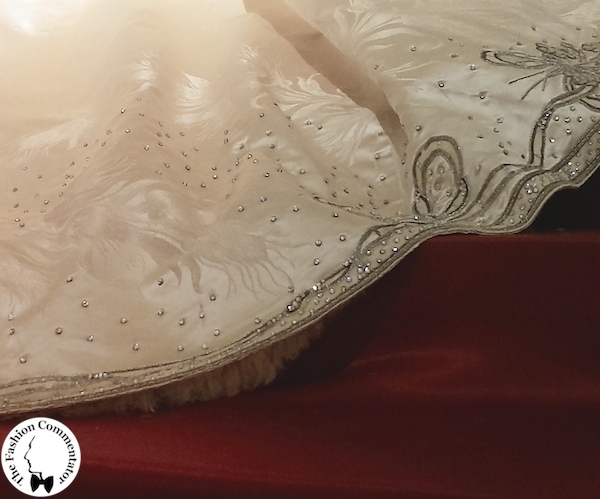 The small exhibition curated by Caterina Chiarelli and Simona Fulceri showcases until the end of July the restoration of a wonderful court cape belonged to Lady Franca Florio at the beginning of the XXth century. 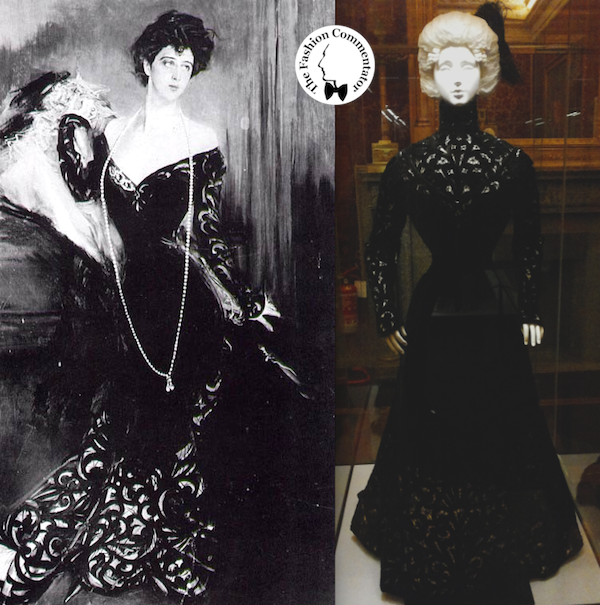 Ideally, the exhibition begins with the third room of the museum, dedicated to two dresses of the famous Sicilian countess: the official court cape with golden Savoy knots, and the long black evening dress reproduced by the painter Giovanni Boldini in one of the portraits commissioned by her husband. 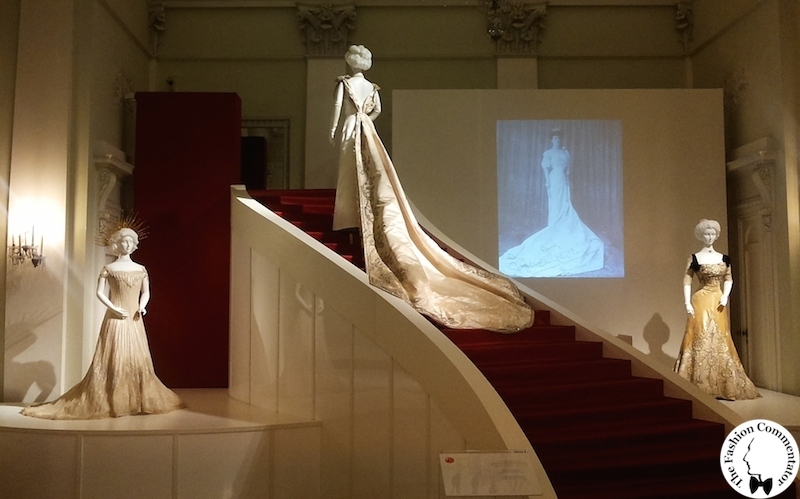 Between these two dresses a small corridor takes the visitors into the Ballroom, projecting them in the splendor of the Savoy court, in which Lady Franca Jacona of San Giuliano, the wife of Count Ignazio Florio, was elected as ‘court lady’ of the Queen Elena. 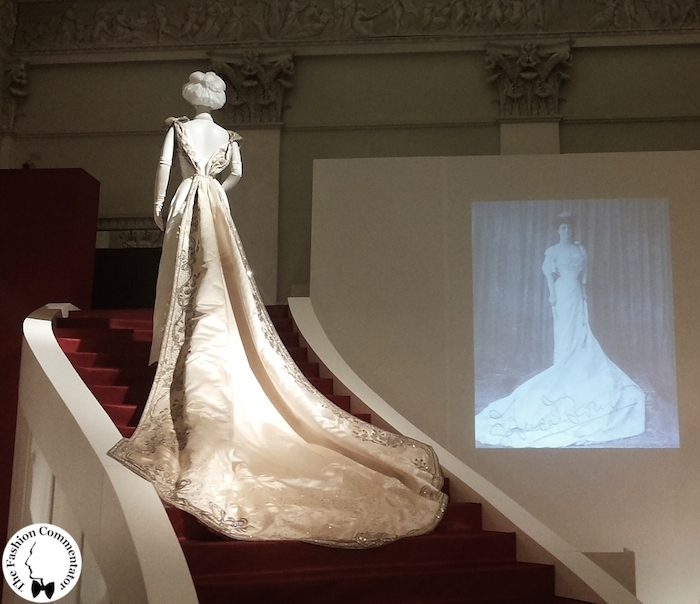 As already written on several occasions on this blog, Franca Florio was one of the most important women of the Belle Epoque. 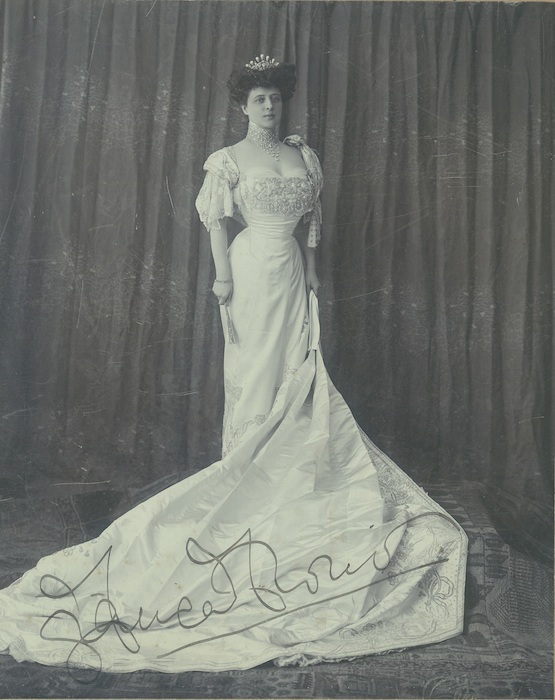 With her charm, she helped her husband to extend his family business among the royal courts all over Europe, launching also Palermo as an international capital. She was very famous for her outfits that occupied the gossip columns of that time, making her one of the most beautiful women in Europe. 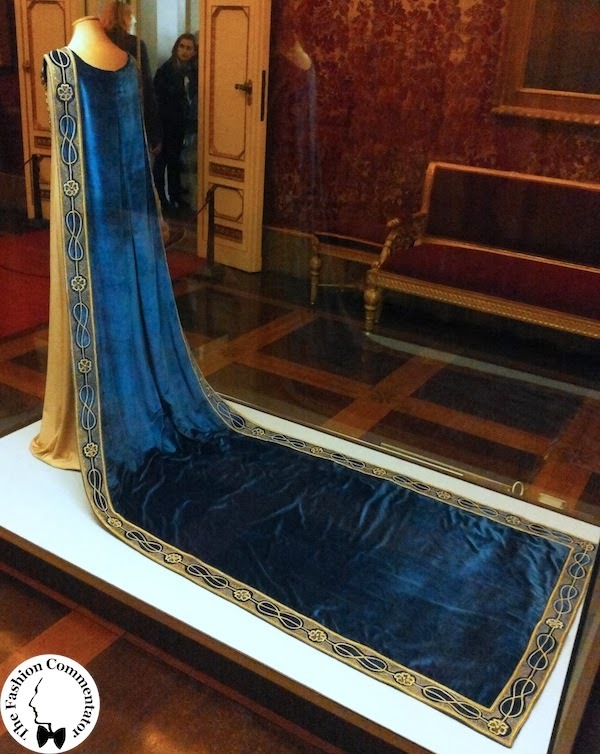 In May 1902 she was elected as ‘court lady’ of Queen Elena, wife of King Vittorio Emanuele 3rd of Savoy, and the exhibition in Pitti Palace showcases the restoration of the precious court cape created for that occasion and that she also worn later in Vienna at the court of Emperor Franz Joseph and in Berlin for Wilhelm 2nd. 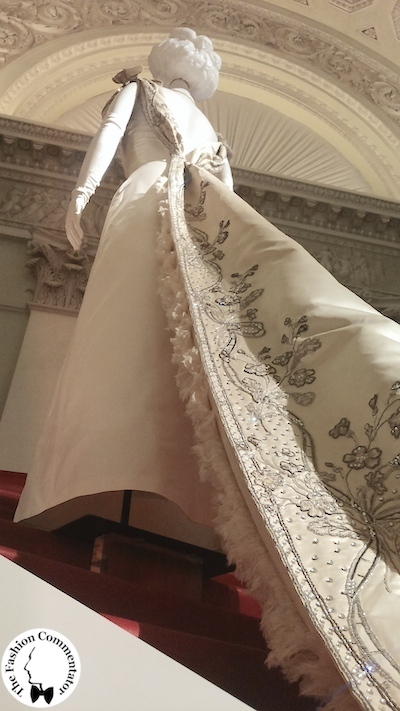 The ivory silk satin damask robe garnished with embroidered sequins, jais and georgette applications resembling the shape of flowers, ribbons and bows, is attributed to the Maison Worth because its style is very close to the other dresses of the exhibition made by the famous Parisian fashion house. 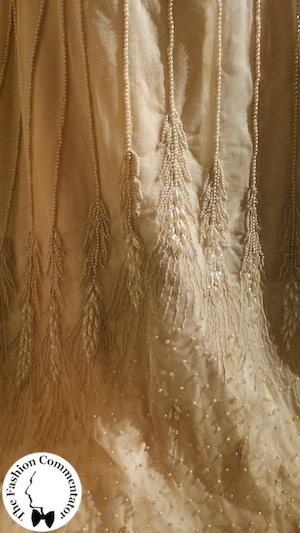 The damask pattern left me breathless for the perfection of the ears of wheat, so in vogue in that period (1902), and I like to believe that this specific plant is a sort of allegory which alludes to the ‘land of the Sun’ (Sicily, the birthplace of Franca Florio) and the season in which the wheat grows (spring-summer). 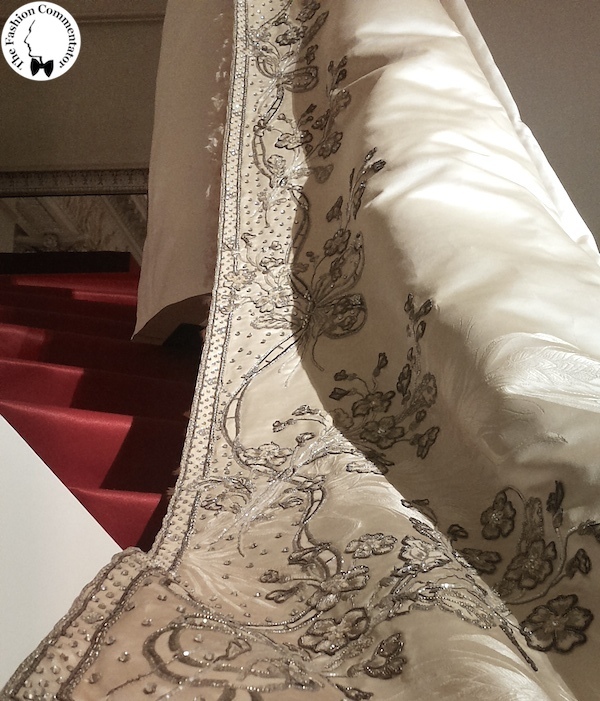 Talking with the two curators, the director Caterina Chiarelli and the textile restorer Simona Fulceri, I discovered that the restoration is the result of a long and complicated series of consolidation interventions on the fabric, which was heavily damaged due to a chemical process based on the use of salts during the production of the yarn. 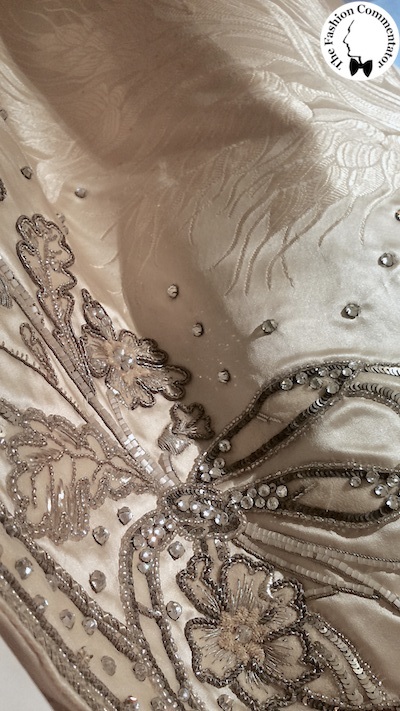 The process of time and the poor storage conditions have worsened the state of the cape, causing the progressive dehydration and shredding of the yarns, making it so fragile, that every little crease immediately turns into deep cuts and tears. 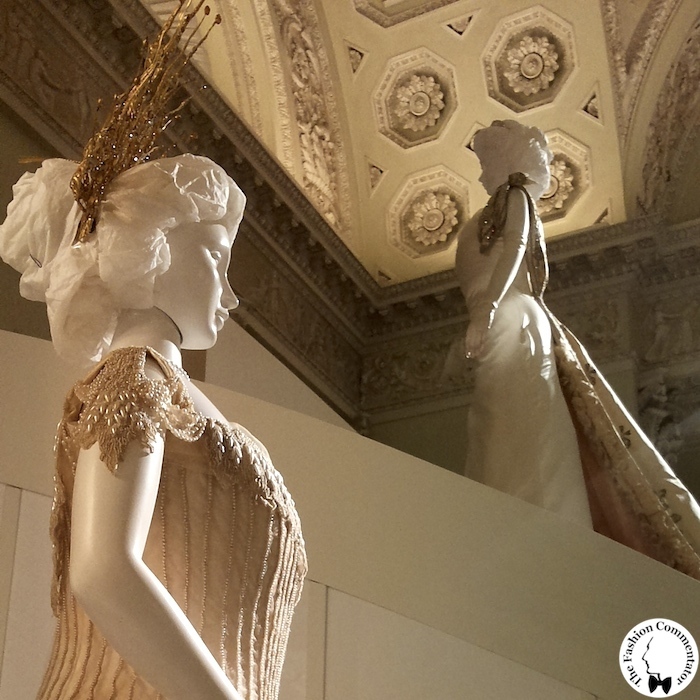 This inexorable process of decay makes this little exhibition a unique opportunity to see this historic piece at its best. 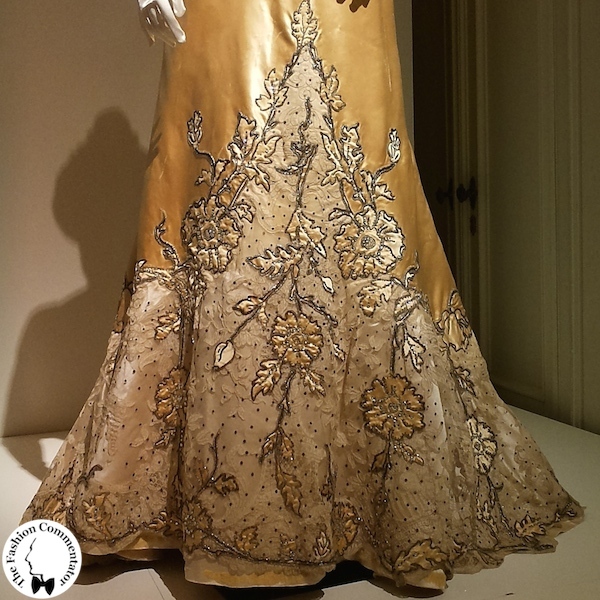 Similar conservative problems characterizes the evening dress with dark floral embroideries made between 1900 and 1905 by Worth fashion house. 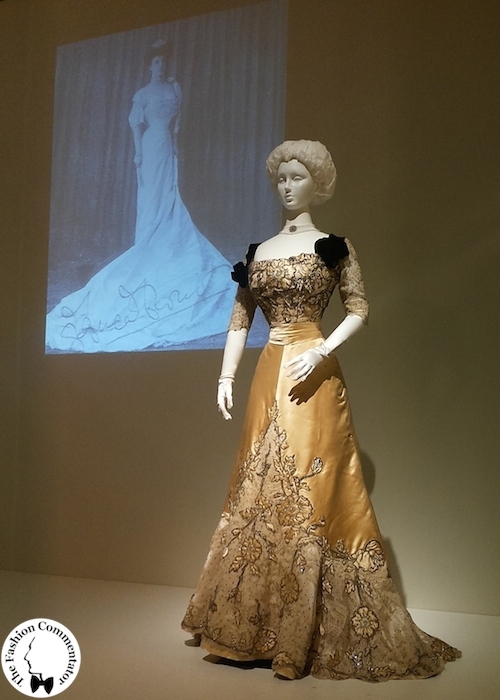 Despite a previous restoration which consolidated the skirt with polyvinyl resin, a lot of new tears came out on the fabric, so the gown needed a new intervention in order to showcase it in the exhibition. 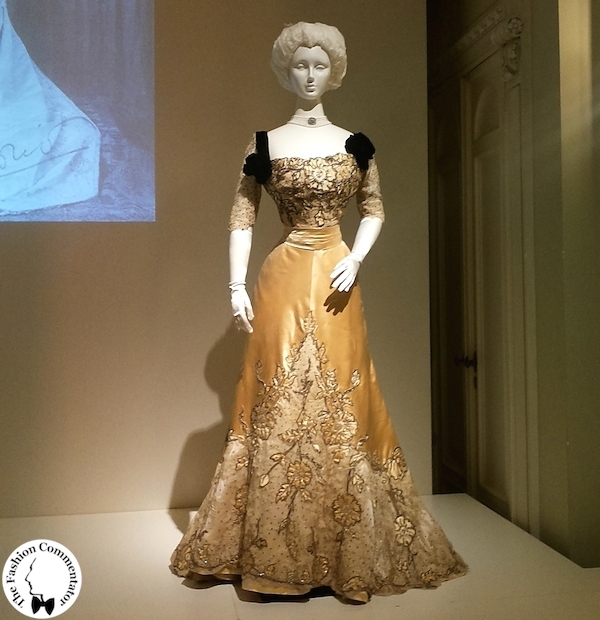 The exhibition ends with the most particular dress of the selection, an evening gown with a sunburst diadem donated to the costume gallery by Franca Florio’s daughter, the Marchioness Giulia Afan de Rivera Costaguti. 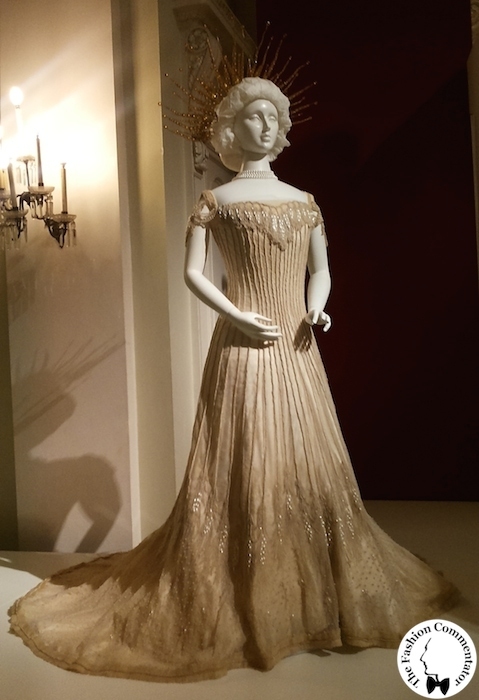 The dress, made by the fashion house Worth in Paris in 1907, has an interesting history because it was worn on the occasion of the tableau vivant “the triumph of light” (the hymn to the Sun from the opera Iris by Mascagni) that went on stage at the sport club in Palermo to honor the visit of the King of England Edward VII and his wife Alexandra of Denmark, on 8 April 1907. 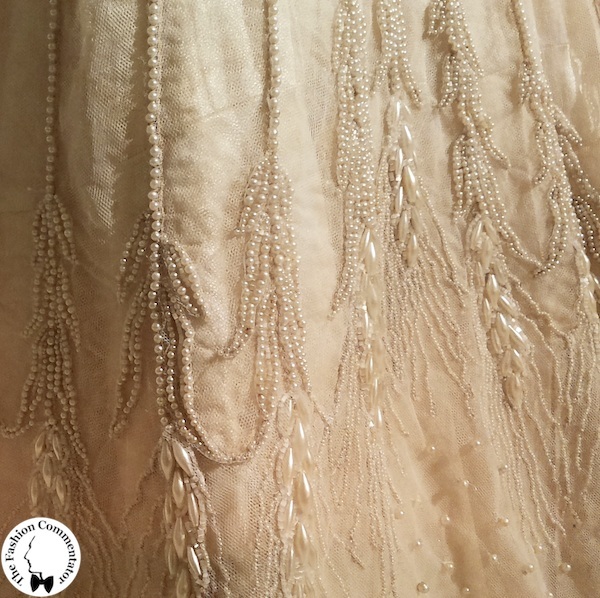 The ivory dress is characterized by a succession of beaded stripes descending from the neckline to the train of the skirt which lengthened the silhouette of Lady Franca Florio (despite she was 173cm high). 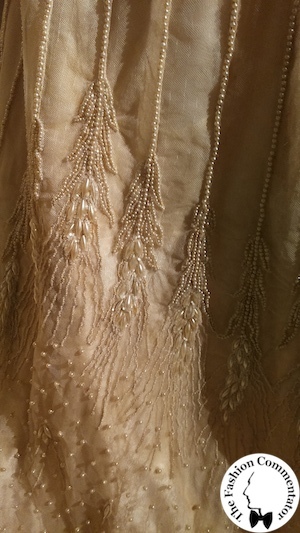 Every stripe ended at the mid-lenght of the skirt with several oblong beads which composed the shape of a ear of wheat. 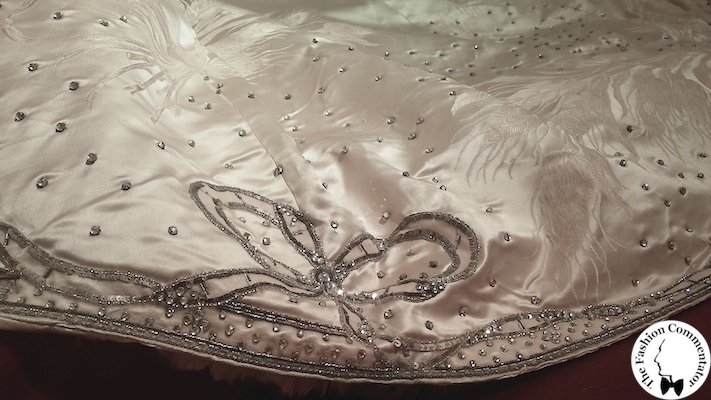 A huge radial crown and a long scepter completed the costume, and thanks to a special mechanism they were lit with little lamps. 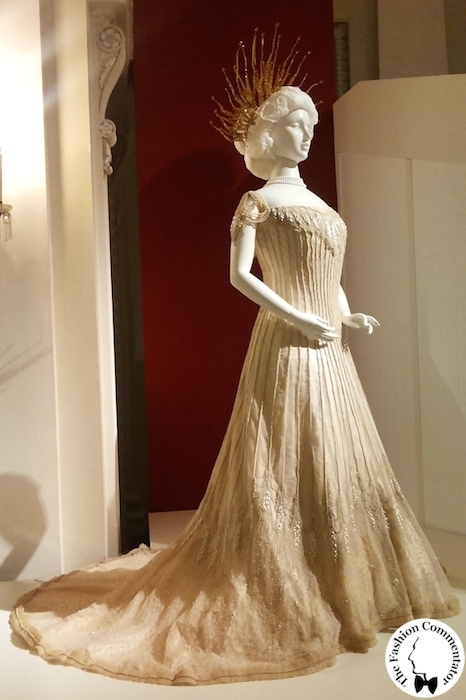 As mentioned above, given the precarious state of conservation of the clothes, but especially their inexorable process of deterioration, this small exhibition is a more than unique must see event in Florence. 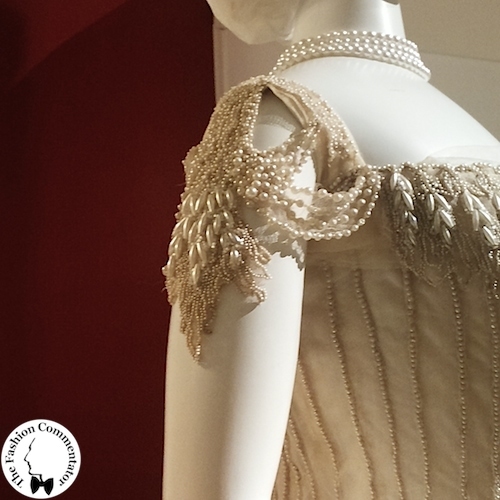 So I invite all the lovers of the Belle Epoque and of Franca Florio to visit the Costume Gallery of Pitti Palace by the end of July to not miss this rare opportunity. 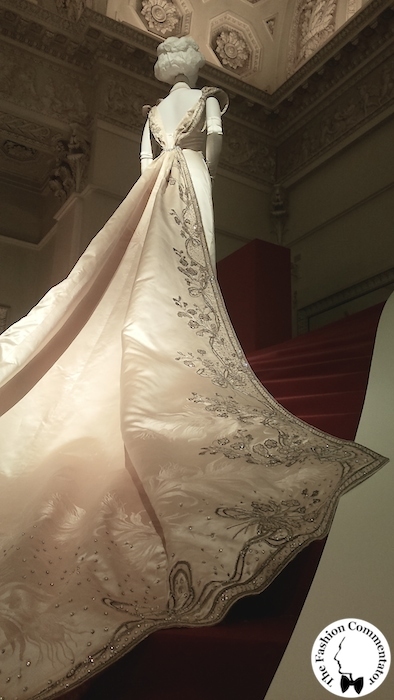 Il manto in raso di seta è semplicemente sublime e la squisitezza dei dettagli è qualcosa che oggigiorno raramente si vede, se non in alcune lavorazioni couture. 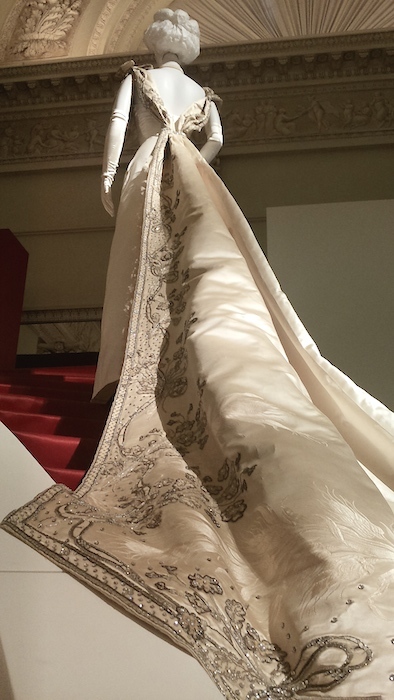 Un vero peccato che un’esposizione del genere abbia avuto poco risalto mediatico a causa della concomitanza con l’apertura di Pitti 86, ma vedila così: hai avuto modo di gustartela in santa pace! Mi dispiace davvero tanto di essermi persa questa anteprima, perché io ho una vera passione per gli abiti di altri tempi! Purtroppo farla durante i giorni di Pitti ha giocato a suo sfavore, in più io dovevo dare una parvenza di donna che fa finta di studiare..quindi ho dovuto rinunciare! 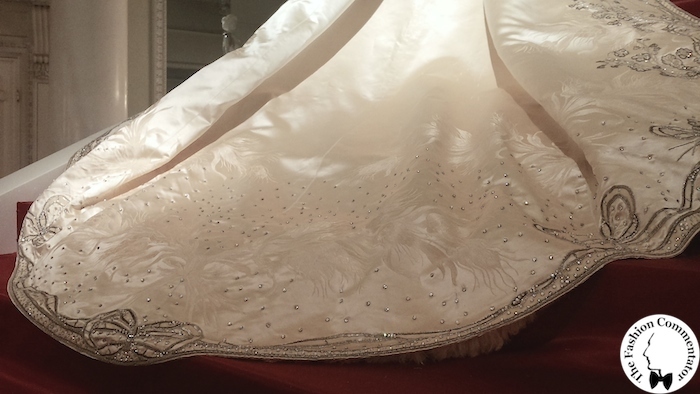 Lo strascico dell’abito sulla scalina è qualcosa di magico, una vera opera d’arte! Che meraviglia Alessandro! Quanto sono effimeri simili capolavori! Poco più di 100 anni sono bastati a segnarli. Temo che il poliestere di Zara sia molto più longevo!! wow! anything that’s about restoration and preserving history, i’m in. 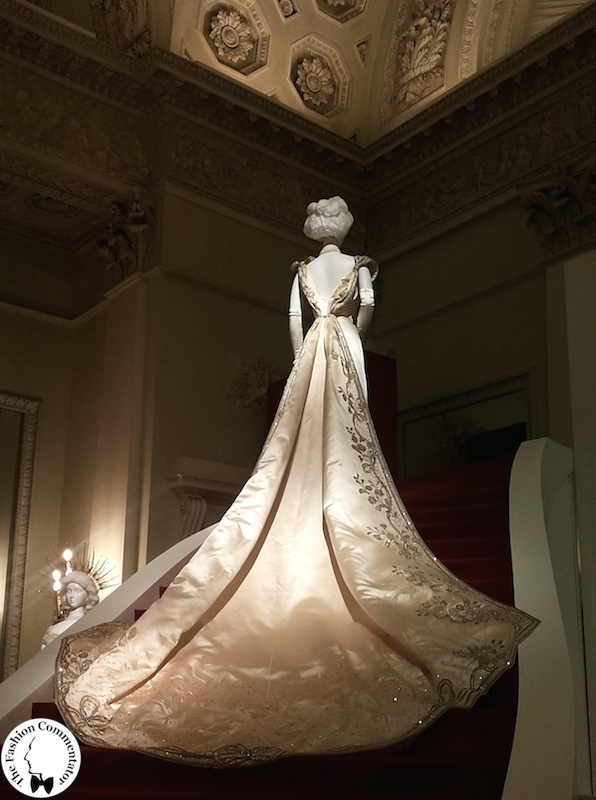 and of course i also love how rich europe’s royal heritage is. every country has its own story to tell.